Peoria is the 9th largest city in the state, and one that has been growing rapidly over the last few decades; in fact, between 1990 and 2000, Peoria was the second fastest growing city in the entire country, with a population growth of 114%. The growth has resulted in numerous new facilities being built throughout the city, including the Peoria Center for the Performing Arts, which was completed in 2007 and the Challenger Space Center of Arizona. Residents looking to live a leisurely lifestyle with an eye towards the many amenities that come with what looks like to be continued growth will want to give Peoria a serious look. Although the typically warm climate allows residents to take it easy and relax, there are a huge number of activities and places around Peoria that encourage a healthy and active lifestyle. In addition to the many community parks and nearby state parks where residents can go hiking, swimming, running, picnicking and much more, there are also plenty of attractions that suit the active lifestyle, from the Sky Zone Indoor Trampoline Park and the Turf Soaring School to the Peoria Sports Complex and the many golf courses around town. A wide range of real estate is available in Peoria, from condos and town homes in the revitalized downtown area to the single-family and luxury homes in the surrounding suburban areas. Some of the house styles you can find in the area include prairie-style, ranch-style, split-level style, Sante Fe-style and Tuscan-style homes. Fletcher Heights – Fletcher Heights is a very desirable community located nearby many restaurants and shopping options. It contains its own park, which has a large playground, basketball courts and lighted tennis courts. WestWing Mountain – A master planned, family-oriented neighborhood, WestWing Mountain is located close to the AZ State Route 101 and the International Airport. Parkridge – Parkridge is another family-friendly community that is located nearby several great amenities, including beautiful Lake Pleasant Regional Park and the Peoria Sports Complex. West Valley Art Museum – The West Valley Art Museum is home to more than 1,000 ethnic dress and textiles, making it the largest ethnic dress collection in the southwest. Additionally, the permanent exhibits contain more than 1,651 items from over 75 different countries. The Challenger Learning Center – Learn about all facets of space by visiting the Challenger Learning Center, which boasts numerous family activities such as Family STAR Nights, a planeterium, light shows and more. Peoria Center for the Performing Arts – Not only does the Peoria Center for the Performing Arts put on award winning community theater, but it also provides summer camps and other children’s programs. Restaurant Row – If you’re looking for the best dining options that the city has to offer, then you’ll find plenty over on Restaurant Row in Peoria Heights. The warm and dry climate that desert areas such as Peoria are known for makes it perfect for outdoor exploration. And there are plenty of ways that you can enjoy the outdoors in and around Peoria. White Tank Mountain Regional Park – If you’re looking for a scenic area to go on a hike, then White Tank Mountain Regional Park is it. There are tons of trails to try out, including the popular waterfall trail. 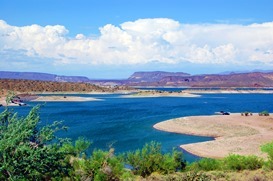 Lake Pleasant Regional Park – A small oasis in the desert, Lake Pleasant Regional Park is the perfect spot to go swimming, sailing, skiing, fishing, hiking or camping. The rapid growth of the city over the last few decades means that there are always employment opportunities. Likewise, the focus on public education in the city means that the public school district is one of the largest employers in the city with over 3,400 staff members. The City of Peoria employs over 1,100 people and is the second largest employer. It doesn’t matter how fast Peoria is growing, the city continues to place an emphasis on the community. In fact, its city mission statement is to anticipate community needs by providing excellent municipal services, embracing diversity and promoting sustainability. Although the city has often been a draw for recently retired individuals due to the excellent retirement communities and the climate, which boasts hot summers and mild winters, the city has become a hot spot for families and individuals looking for career opportunities due to the continued economic growth of the last few decades.